Add Kopitiam to your favourites! Add JUMBO Seafood to your favourites! Add Saizeriya to your favourites! Add Astons to your favourites! Add Old Chang Kee to your favourites! Add Sushi Tei to your favourites! Add Cedele to your favourites! Add Tim Ho Wan to your favourites! Kopitiam Singapore features a wide variety of food stalls of various types of cuisine, including Chinese, Malay, Indian, Korean, Japanese, and many more. There are over 90 Kopitiam Singapore outlets scattered all across the island in shopping malls, housing estates and industrial estates. Good and affordable local food is never far away! Get the Kopitiam Card to enjoy cashless payment and a 10% discount off your meals! Looking for something healthy? Visit the 'Healthy Kopitiam', Singapore's pioneer full-fledged healthy food court that's also joint initiative with the NUH Department of Dietetics and is supported by the Health Promotion Board (HPB). The Kopitiam Group pioneered the popular 24-hour food shop concept in 1988, which inspired a trend that has now become a norm in Singapore. 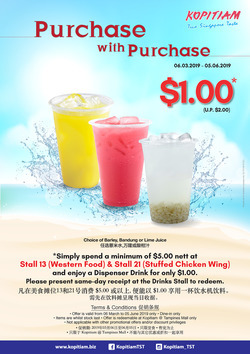 Do you want to receive more offers from Kopitiam by email?